A Polar Bear's skin is actually black. 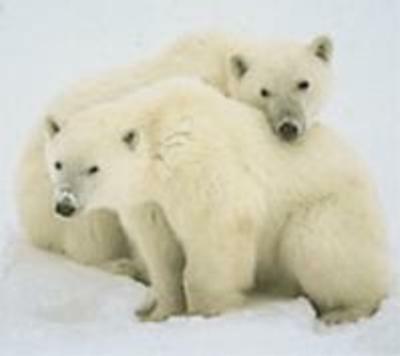 Compared to all bears, Polar Bear's have the thickest fur. Here are some of our ongoing activities and ways you can help support KMAD. Recyle: we're saving the environment while raising funds for endangered wildlife! Empty ink cartridge recycling: Help us protect our environment while helping animal. Request our ink jet and cartridge recycling labels. City Street Adoption and Clean Up: We are doing our part to help keep our environment clean for the animals, for people, for everyone. Check with you local to city to see if they have a clean-up. If not, why not start one! GoodSearch.com - search the web, help an animal. KMAD gets 1¢ every time you search the web. Why Google when you can GoodSearch? In the box "Who do you goodsearch for?" please type Kids Making A Difference and KMAD will recieve a penny per search or if you shop through GoodShop a percentage from your purchase. Thanks! Shop: Let your shopping do the giving. When shopping go to one of the following areas and shop for a cause. A percentage of your purchase will be donated to Kids Making A Difference. Goodshop Go to Goodsearch site and choice shop. Yellow Brick Mall: Go to www.yellowbrickmall.com/kmad.php and shop. A percentage of your sale will be donated to Kids Making A Difference. Grocery store share program: Kroger and Albertson's will donate 1% of your purchase to KMAD! E-mail us for your share program card. Want more information on how to participate in any of these? Send us an e-mail. Thanks for your support!